John Logie Baird was born on 14 August 1888 in Helensburgh on the west coast of Scotland, the son of a clergyman. Dogged by ill health for most of his life, he nonetheless showed early signs of ingenuity, rigging up a telephone exchange to connect his bedroom to those of his friends across the street. His studies at Glasgow University were interrupted by the outbreak of World War One. Rejected as unfit for the forces, he served as superintendent engineer of the Clyde Valley Electrical Power Company. When the war ended he set himself up in business, with mixed results. He moved to Folkestone in 1924 where he did his early experimental work at 26 Guildhall Street, where he managed to transmit a flickering image across a few feet. T.C. 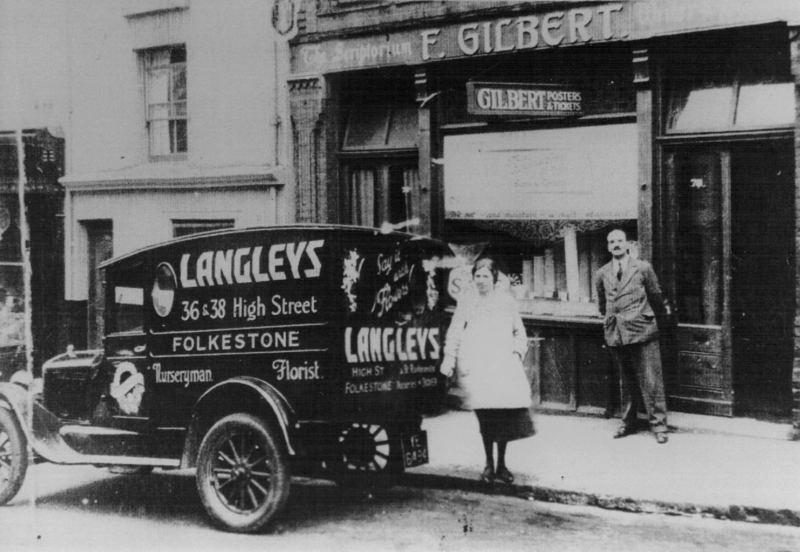 Gilbert & Co. Ltd., electrical & radio engineers occupied the shop at the time. (See headed notepaper) where he did his experimental work in the basement. My late father, Fred Taylor was an apprentice electrician at Gilbert’s at the time and he remembered Logie Baird doing his experimental work there. A plaque was unveiled by his wife to commemorate his work on the premises. The shop is now occupied by Shadow Artworks where the plaque is displayed on one of their walls inside. While working in Folkestone Logie Baird stayed at Mrs Gilbert’s Boarding House, ‘Flordon House’, 10 West Terrace. Mrs Gilbert was the wife of F. Gilbert (brother of T.C. Gilbert) he was a writer and designer. He conducted his business at 78 The Bayle, Folkestone. (See photo below).